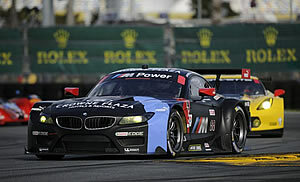 Successful USCC debut: BMW Team RLL comes second and fourth at the Daytona 24 Hours. January 26, 2014 - BMW Motorsport and BMW Team RLL experienced a successful start to the United SportsCar Championship (USCC), securing an impressive podium result in what was the start of a new era in American motor racing. The number 55 BMW Z4 GTLM crossed the line second in the GTLM at the 24-hour race of Daytona (US), after completing a total of 679 laps of the iconic “Daytona International Speedway” road course. Bill Auberlen (US), Andy Priaulx (GB), Joey Hand (US) and Maxime Martin (BE) struggled to match the pace of their direct opposition on the long straights, due to the significant top speed deficit of their BMW Z4 GTLM. However, BMW Team RLL made up for this thanks to a great strategy, consistent lap times and a largely flawless performance by the crew, securing its maiden USCC podium in the process. GTLM victory in the American endurance classic was secured by Porsche’s Nick Tandy (GB), Richard Lietz (AT) and Patrick Pilet (FR). At the finish line, final stint drivers Hand and Pilet were separated by only 2.838 seconds. The number 56 car, driven by Dirk Müller (DE), John Edwards (GB), Dirk Werner (DE) and Graham Rahal (US), also battled it out at the front of GTLM for long periods of the race. It was running in third when it lost ground after the rear right wheel bearing had broken. The necessary repair work cost the BMW drivers several places. But the white BMW Z4 GTLM made a brilliant recovery, ultimately finishing fourth and collecting valuable points at the season opener. In the fiercely contested GTD class, Turner Motorsport flew the flag for BMW. Augusto Farfus (BR), Paul Dalla Lana (CA), Dane Cameron (US) and Markus Palttala (FI) didn’t lose their fighting spirit following several setbacks in the early stages of the race and fought their way back up with the number 94 BMW Z4 GTD. After 24 hours and 659 laps, Turner Motorsport secured seventh in class. After this promising start to the 2014 USCC season in a race the team had never entered before, Sebring (US) is next on BMW Team RLL’s list. On 15th March the two BMW Z4 LMGTs will fight for top positions again at the classic 12-hour race. In the American Le Mans Series Bobby Rahal’s (US) team claimed GT wins there in 2011 and 2012 when it was racing a BMW M3 GT.